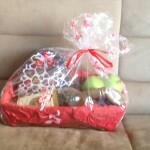 Send a gift basket to a loved one in Israel and support Torat Reva Yerushalayim at the same time! Send Matanot L’Evyonim to Jerusalem’s Impoverished Elderly for $18! Click here for details. All of the baskets below can be used for Mishloach Manot! 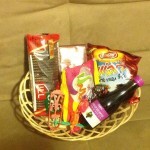 This basic basket is filled with a small bottle of grape juice, Hadar cookies, Doobonim snacks, Dark Chocolate Bar, Marshmallows, Lolly Pop, Taffies and a grogger. 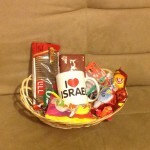 This basic basket is filled with an I love Israel mug, Hadar cookies, Doobonim snacks, Dark Chocolate Bar, Marshmallows, Lolly Pop, Taffies and a grogger. 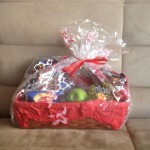 Basic Rosh Hashana Basket includes a large heart filled with chocolate hearts, apples and honey, pretzels, Bamba and a large bar of dark chocolate. 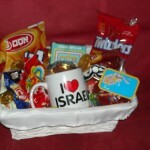 This cloth lined wicker basket includes an I love Israel mug with taffies and Chanuka gelt (chocolate coins) inside, a box of Chanuka candles, Lolly Pops, Klick chocolates, a Twizzler package, Bisli, Bamaba and potato chips. 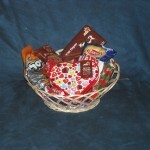 Deluxe Basket includes a large heart filled with chocolate hearts, Rolladin wafer rolls, Klick chocolates, Mike and Ike Jelly Beans, Bisli, Bamba, a wafer, pretzels and taffies. 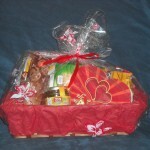 Deluxe Rosh Hashana Basket includes a bottle of King David Muscat Wine, a large heart filled with chocolate hearts, apples, honey, jam and whole wheat crakes. 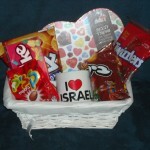 This cloth lined wicker basket includes an I love Israel mug with taffies inside, a large heart filled with chocolate hearts, Klick chocolates, Mike and Ike Jelly Beans, a Twizzler package, Bisli and potato chips. 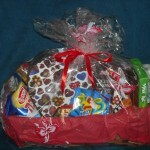 Basic Basket includes a small heart filled with chocolate hearts, Bisli, Bamba, a dark chocolate bar, smiley cookies, a wafer and taffies. Lovely Treats includes a medium heart filled with chocolate hearts, a dark chocolate bar, smiley cookies, a wafer, a jar of jelly, a package of crackers, pretzels and Rolladin wafer rolls. 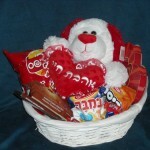 A stuffed animal holding a heart with a Hebrew expression of love is packed in a cloth lined wicker basket with a medium heart filled with chocolate hearts, Bisli, potato chips, smiley cookies, Bamba, a dark chocolate bar and taffies. 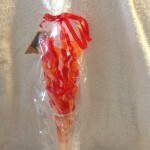 Beautiful glass vase filled with jelly beans and skewers with gummy bears and heart gum drops!